Not one single candle, but 87, to make her eyes shine as bright as the first time you kissed her. Lighting them all up takes patience, care and attention to detail. It’s the just the same as for love: you need time to make it grow, and you need dedication to keep it alive. 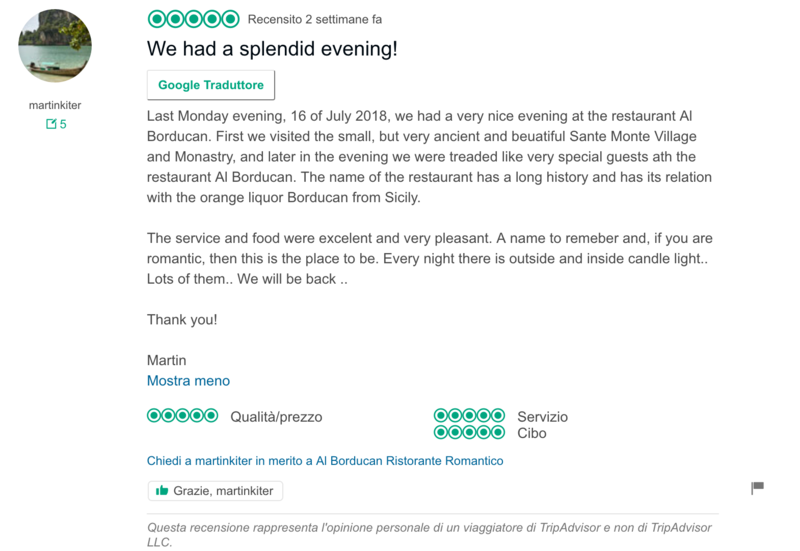 That is why, each night, at Al Borducan the first Love Restaurant in Italy, 87 candles are carefully lighted up one by one to create the most romantic atmosphere ever. Every day, show her how much you love her by making time for her, then choose to surprise her – either on a special occasion or when she least expects it – with a unique candlelight dinner at our Love Restaurant: invite her for a dreamy date night and enjoy delicious gourmet cuisine in the surroundings of an elegant Art Nouveau building with a breath-taking view over the lakes. A warm, welcoming smile will greet you while you step into the beautifully decorated dining hall at the silky, smooth sound of jazz and Dixie music. She’ll look even more gorgeous in her favorite evening dress while she crosses the room and swings towards the finely set table, charmingly tucked away in a peaceful, silent spot. Make the most of each other’s company by treating yourselves to an exclusively romantic dining experience. Take your other half to Al Borducan Romantic Hotel & Restaurant for a Candlelight dinner and choose to spoil her with the most precious gift ever: your own time. Please note that, in order to ensure privacy and tranquility, limited seating is available. We kindly invite you to make reservations as far in advance as possible to secure the most suitable day and time. How long before should I make my reservation? We usually recommend you reserve your table at least 2 weeks in advance (4 weeks in advance if you’re planning to come over the weekend). Do you serve a specific set menu during the Candlelight dinner? Is it possible to seat outside while enjoying the Candlelight dinner? Yes, it is. If the weather is nice, you are more than welcome to dine on our panoramic terrace. Do you only take reservations for two people? Yes, we do. The Candlelight dinner is indeed meant to be a couples’ only experience, artfully created for you and your other half to enjoy a really wonderful night in the most romantic, intimate atmosphere ever. Do you accept changes to the tasting menus? Yes, you may request up to 2 changes to our tasting menus. In case you wish to make more than 2 changes, then we suggest you order à la Carte. 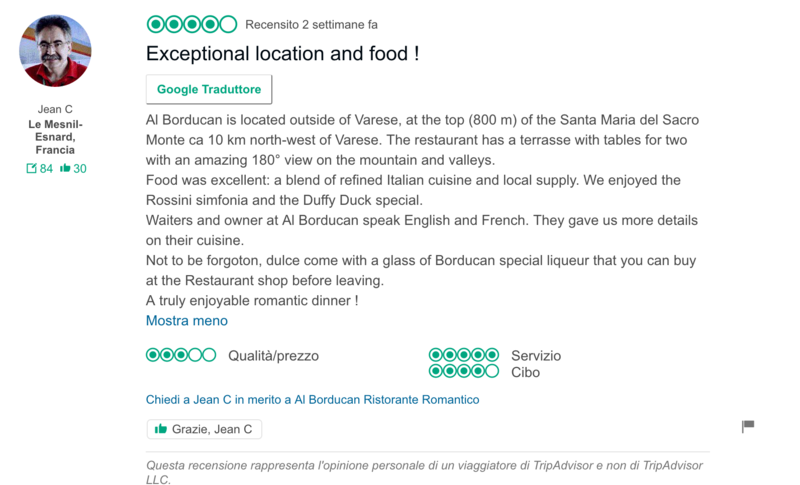 Please click here to <Discover the menus>. You are welcome to bring small size dogs with you as long as they are quiet and well behaved. Out of courtesy to all our guests, we kindly ask you to bring no more than one dog per table. What if we liked to bring our kids? Unfortunately, both due to safety reasons/limited space and in order to allow all guests an evening of true relaxation, we believe the Candlelight dinner should be an adult-only occasion. We hope you’ll understand the reason for our choice and you’ll still be happy to join us for an unforgettable night with your loved one. May we have the chance to stay overnight? Yes, we’d be delighted to have you stay at our Hotel. Uniquely decorated in sophisticated Art Nouveau style, our 9 rooms are authentic peaceful retreats, equipped with all amenities in order to ensure maximum comfort and quietness. Are you looking for something more Luxurious? 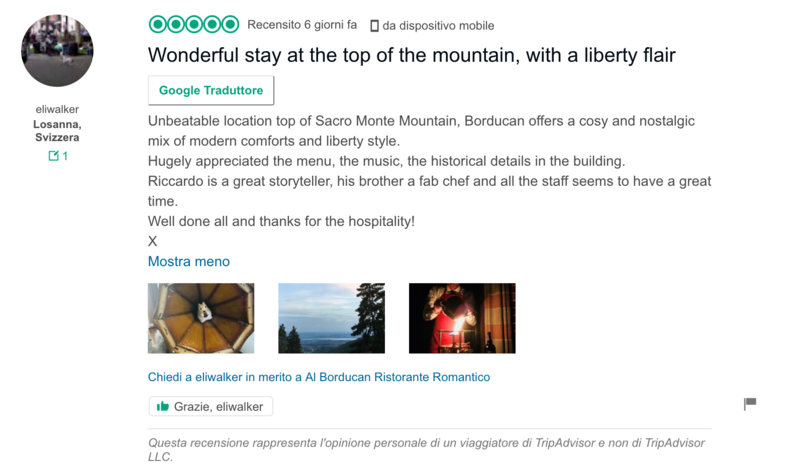 Click here and discover our “Lusso di Coppia” package, a dinner only for two, served in our most Romantic Suite.